The two official Kenya languages are English and Swahili (called Kiswahili in the language itself). Both are taught at schools throughout the country. Literacy is high in Kenya: 85 percent of people over 15 can read and write. However, as language is the most important denominator of ethnic groups in Kenya (there are between 40 and 70, depending on how you count), there are much more indigenous languages than just Swahili. English of course originates from the British, who colonized the country from the end of the 19th century until Kenya’s independence in 1963. Swahili is a Bantu language (the Bantu peoples encompass several tribes, such as the Kikuyu and Meru) with a strong Arab and Persian influence, as traders of these countries have frequented East Africa for ages. Swahili is actually relatively easy to learn - the grammar is quite simple and the pronunciation isn't confusing. Apart from being the main language in two countries – Kenya and Tanzania – Swahili has become a lingua franca (general working language) for the whole of East Africa. 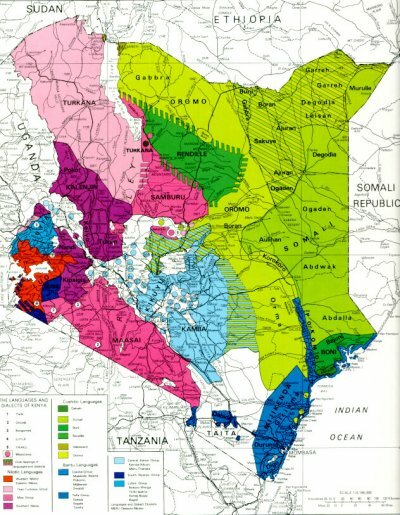 Over 50 million people speak Swahili, although only 5 to 10 million of them are native speakers. The others have it as a second language, reason why it’s loosing some of it’s richness. Most urban Kenyans, and those who deal with tourists in rural areas, speak English well. Along the coast and in the national parks, many hotel employees, safari operators etc. also speak some German and Italian. So it’s easy to communicate with Kenyans. However, you’ll find that Kenyans appreciate it a lot if you make the effort to learn some Swahili words. It’s a quick way to make friends – apart from dropping the name of some famous soccer player from your country, of course. Another Kenya language you’ll encounter is Sheng. This is a mixture between Swahili and English with some traces of Hindi, Gujarati and other tribal languages. It is spoken almost exclusively by Kenyan youth. If you don’t speak Swahili, you’ll not be able to distinghuish Sheng from Swahili. Hindi and Urdu (both spoken by Hindustani – Urdu is the national language of Pakistan) are still spoken by residents who originate from the Indian subcontinent. They often live along the coast. Greetings to a male - Lo murrani! Supa! Greetings to a female - Na kitok! Takuengya! How are you? – Waigua atia? How are things? – Kweruo atia? How do you do? – Iriyo nade?